Camogli (Camuggi in Genoese dialect) is a small Italian fishing village and tourist resort located on the west side of the peninsula of Portofino, on the Golfo Paradiso at the Riviera di Levante, in the province of Genoa on the Italian Riviera. As of 31 December 2010 its population was of 5582 inhabitants. The name means "house of wives" ( casa delle Mogli ). Camogli is one of the largest part of the Parco Naturale Regionale di Portofino, and a part of the Portofino Marine Protected Area. Camogli was in the late Middle Ages a considerable seaport. In its heyday, the fleet consisted of hundreds of Camoglis Tall Ships. It was called the "city of a thousand white sails." 1798, the city has a large contingent of Napoleon's fleet, which was beaten in Egyptian waters of the Nile by Admiral Nelson. This prestigious naval college founded in 1874, Cristoforo Colombo is the nautical tradition as well as a retirement home for masters. In 1880 the city had (in a population of 12,000) 500 patented ship captains. 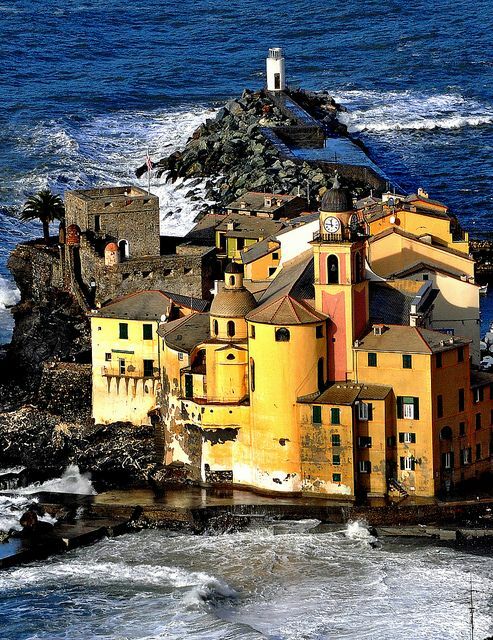 The former fishing village of Camogli, which now lives mainly from tourism, is known for its colorful houses that line behind the beach. The colors once helped the fishermen of Camogli, easier to catch the way back to their port. Known until today nationwide, the first division of the local swimming club water polo RN Camogli to have won after the Second World War, several Italian championships. A beachfront swimming pool is one of the most important recent buildings.